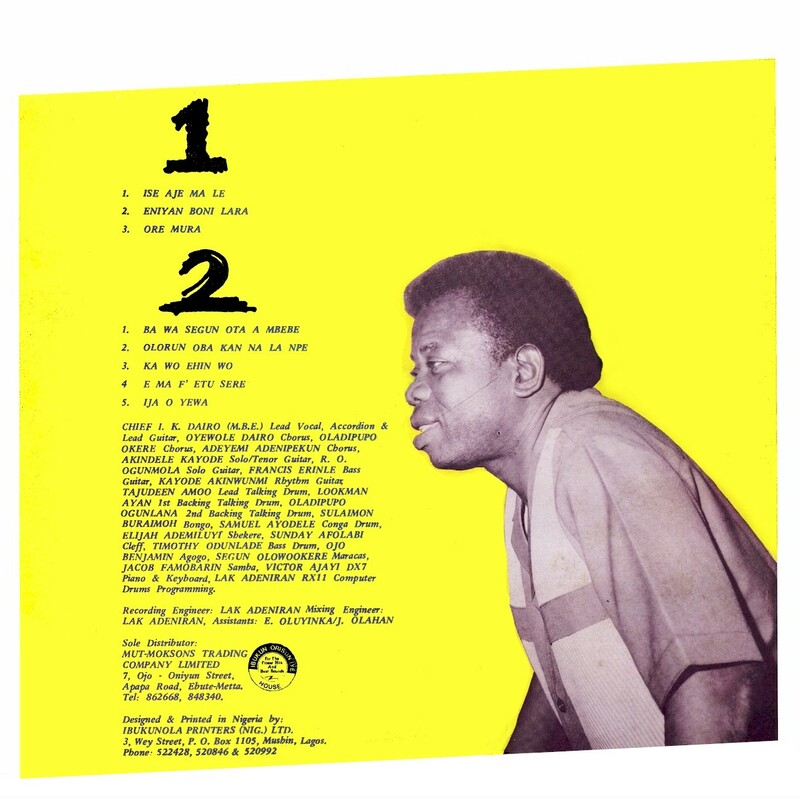 Like a lot of people, I got into Nigerian jùjú music in 1982 when King Sunny Adé hit the international scene. In short order Ebenezer Obey, Dele Abiodun and Segun Adewale were introduced to world audiences, with varying degrees of success. Before them, though, I.K. Dairo was the true king of jùjú . Isaiah Kehinde Dairo (b. January 6, 1931), the son of a carpenter, performed with many of the greats of the Ibadan jùjú scene while working days in a variety of odd jobs. He launched his first professional group, the Morning Star Orchestra, in 1954, changing their name to the Blue Spots in the early '60s. Dairo introduced the accordion to jùjú music and was responsible for many of the innovations, including Latin American and Christian choral influences and the use of various dialects, that are hallmarks of the mature jùjú style. Dairo and the Blue Spots went into eclipse during the '70s with the ascension of younger stars, but made a comeback in the '80s, achieving international recognition with several CD reissues and new recordings. Ma F'owuro Sere (Ibukun Orisun Iye MOLPS 112, 1987), presented here, is an excellent example of I.K. Dairo's late style (I apologize for a bit of unfortunate "wow" on Side 1, apparently caused by a spindle hole that is slightly off-center). 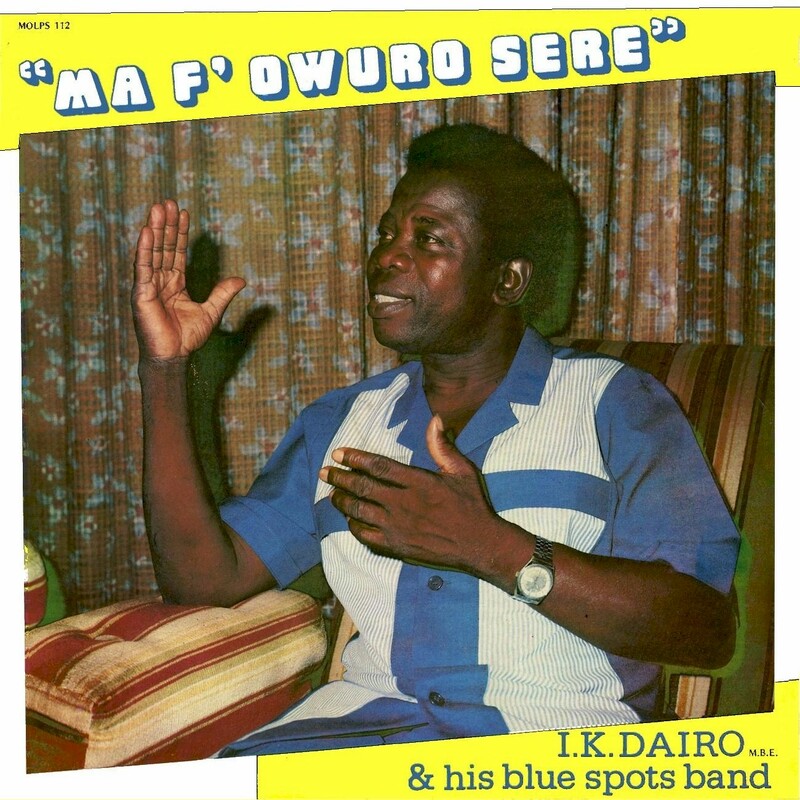 Dairo died February 7, 1996 of renal failure. His wake-keeping, beginning on April 15, went on for five days and was attended by tens of thousands. In addition all Nigerian musicians refrained from performing during that time and Radio Nigeria played nothing but his music. Truly a fitting tribute to a giant of Nigerian music! Download Ma F'owuro Sere as a zipped file here. Information for this post was derived from the liner notes of two excellent recordings, Definitive Dairo (Xenophile XENO 4045, 1997) and I Remember (Music of the World CDC-212, 1991), as well as Christopher Waterman's definitive Jùjú: A Social History and Ethnography of an African Popular Music (University of Chicago Press, 1990). These are all available for purchase or download (just click on the links)!